Please bookmark this page as you will need it to initiate the GET HELP service. To get started, please provide a brief account of your problem and what questions you have in relation to it. There is no need to provide a historic account of events leading up to your current situation. Begin by describing what your immediate concerns are and what help you need. Provide any necessary details such as: dates, a brief description of the events that occurred, the name of the police force or authority involved, and your location. You can provide further details or attach documents later. You will receive an initial reply within 24 hours. 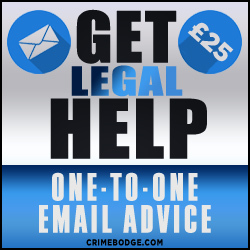 You will be supplied with the ‘Get Help’ email address where I will correspond with you until your questions have been answered. Please use the box below to initiate the service. If the Paypal account you used to make purchase is under a different name please mention this. If no Paypal payment is matched will be asked to provide a Paypal Transaction ID before service commences. This is to ensure that this page cannot be shared and used by those who have not paid for the service. Please note that telephone assistance is not part of this service and any telephone requests or calls made will be redirected back to this email service. Thank you for your custom and I look forward to helping you.